In hindsight, it should be no surprise that THQ jettisoned its expensive exclusive license to make video games with the UFC's imagery and fighters. The company is hurting badly and had gone through a huge, soul-searching reorganization, jettisoning its kids-stuff division and completely bailing on E3 this year as its stock price hovers around 66 cents. 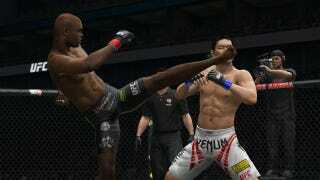 In a surprise announcement Monday, EA Sports revealed it had bought the UFC license from THQ. At E3, the executive vice president heading EA Sports, Andrew Wilson, told me the "ink is still wet" on the contract when I tried to pin down when his label's first UFC simulation title will release, and what that would mean for Fight Night. Released roughly every two years, Fight Night would be due for another round in 2013. It's my understanding the UFC project hasn't even been assigned internally yet. Fight Night is built by EA Canada; EA Sports MMA the publisher's 2010 foray into mixed martial arts, was made at EA Tiburon. It's unknown what this means for THQ's WWE business. EA Sports may have too much on its plate to go after that. When I inquired about EA Sports' interest in Major League Baseball, Wilson demurred, saying that the label had just taken on a large, long-term deal and was focused on delivering on those obligations.